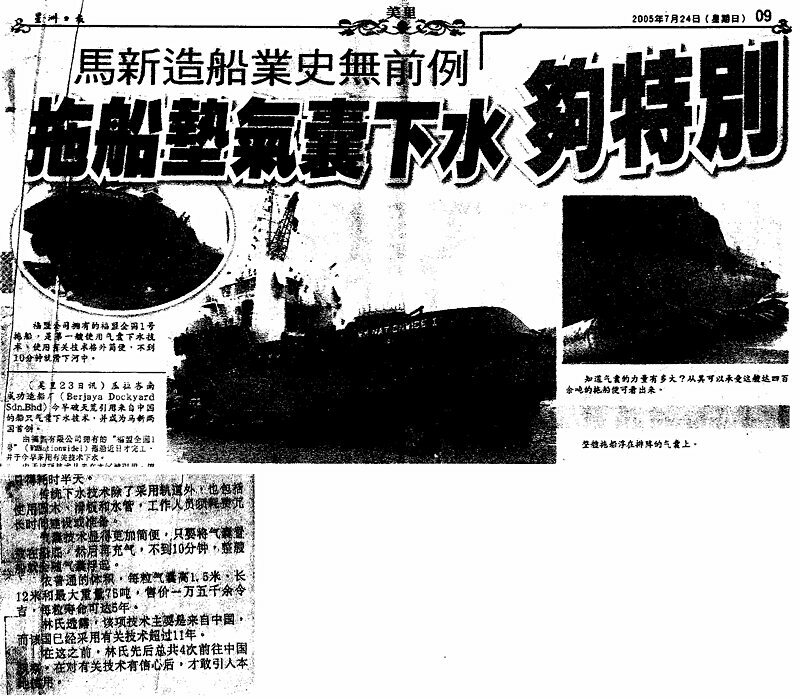 Berjaya Dockyard Sdn Bhd - the first dockyard in Malaysia to adopt the use of airbag technology from China for the vessel launching. 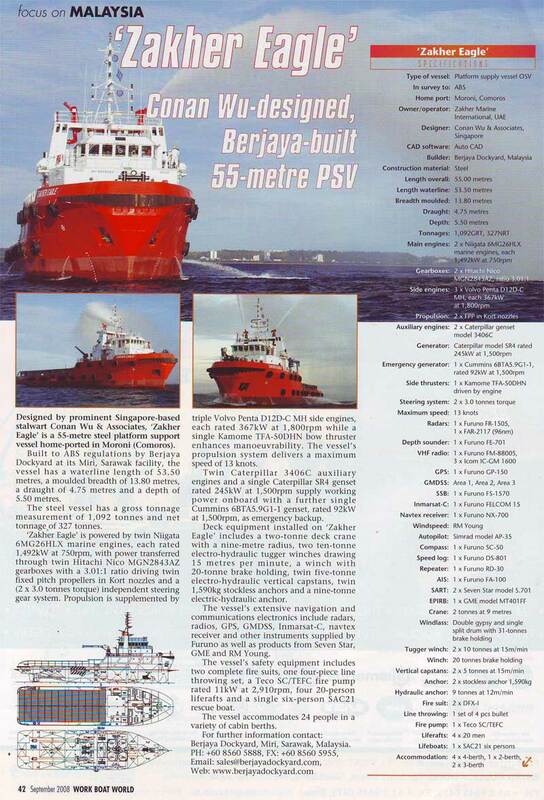 Malaysian shipbuilder Berjaya Dockyard was established in Miri, Sarawak, by its Managing Director, Mr Ling Chu Ek in 2004. 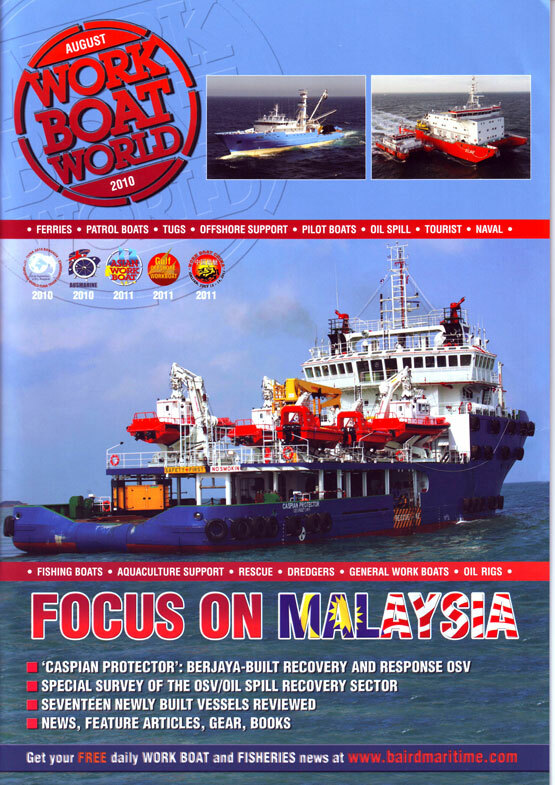 The Sarawak region of Borneo in Malaysia is becoming well-known for its large number of shipbuilders, building a wide range of high-quality workboats for both the local and international markets. 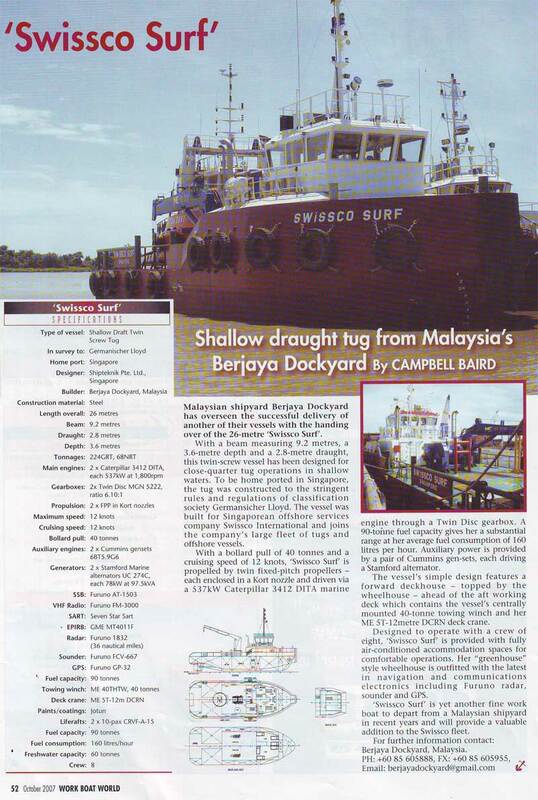 Malaysian shipyard Berjaya Dockyard has overseen the successful delivery of another of their vessels with the handing over of the 26 metre 'Swissco Surf'. 'Intan AHT 1' designed by Conan Wu and Associates of Singapore, Berjaya Dockyard's newbuild 'Intan AHT 1' has an overall length of 45 metres on a beam of 11 metres, with a 3.2 metre draught. 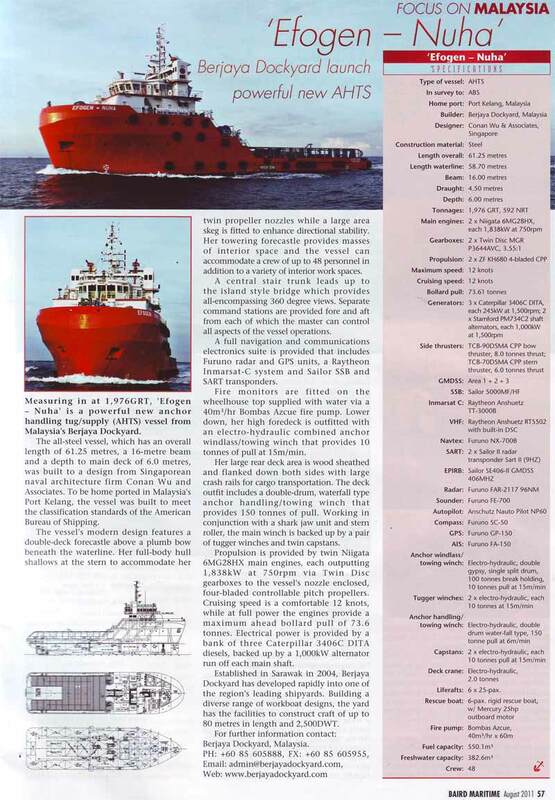 'Zakher Eagle' designed by prominent Singapore-based stalwart Conan Wu & Associates, 'Zakher Eagle' is a 55-metre steel platform support vessel home-ported in Moroni (Comoros). 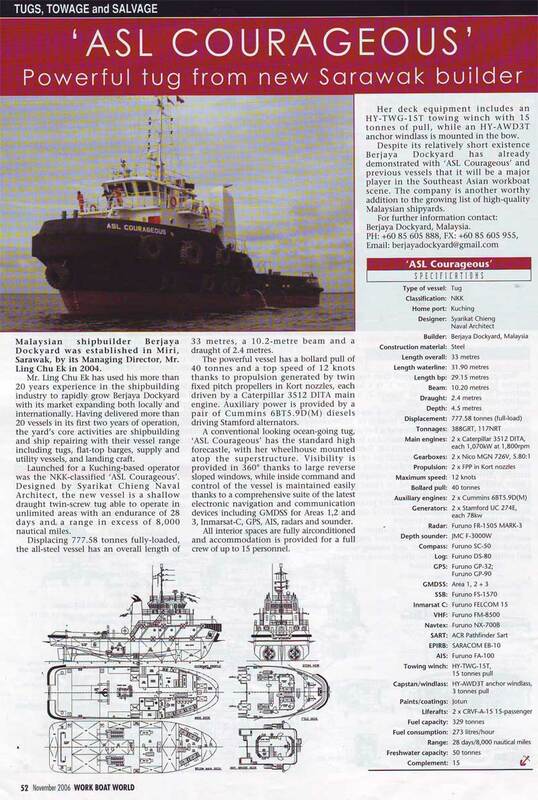 'Zakher Emperor' built by Malaysia's Berjaya Dockyard under survey to ABS, 'Zakher Emperor' is owned by Zakher International and home-ported in Moroni, Comoros. 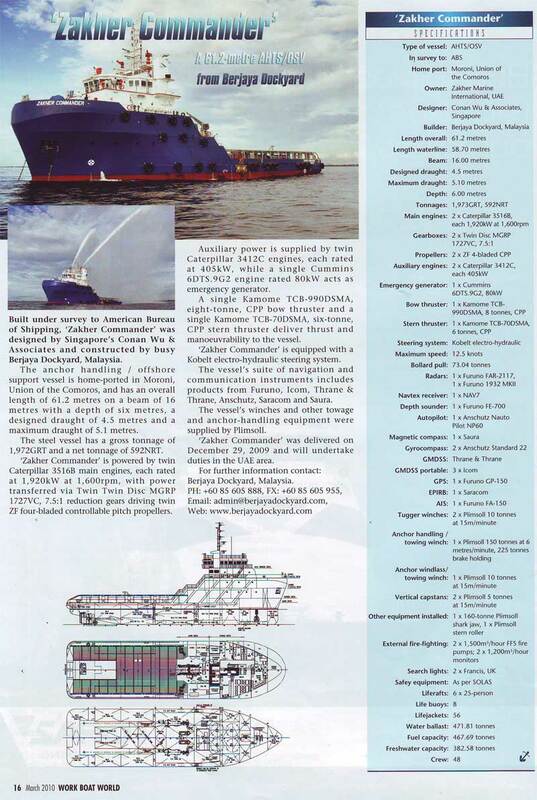 'Zakher Commander' built under survey to American Bureau of Shipping, was designed by Singapore's Conan Wu & Associates and Constructed by busy Berjaya Dockyard, Malaysia. 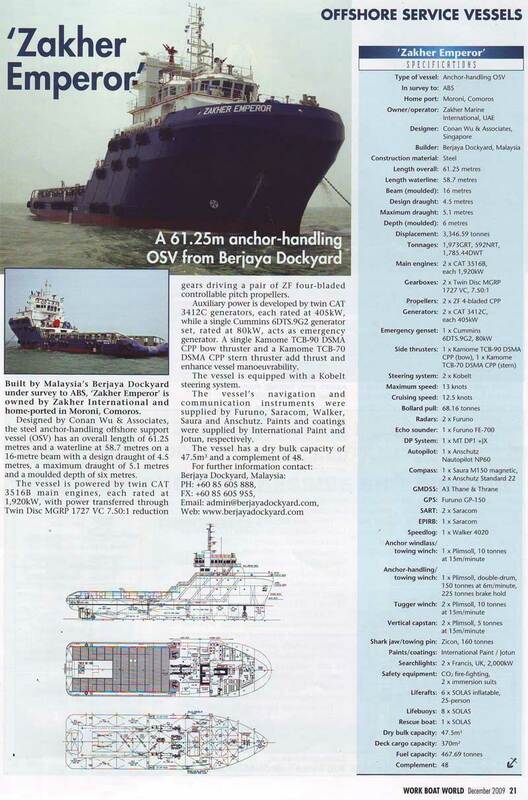 Miri: Berjaya Dockyard Sdn Bhd targets to further position itself as a premier offshore support vessel builder for both Malaysia and the international market. 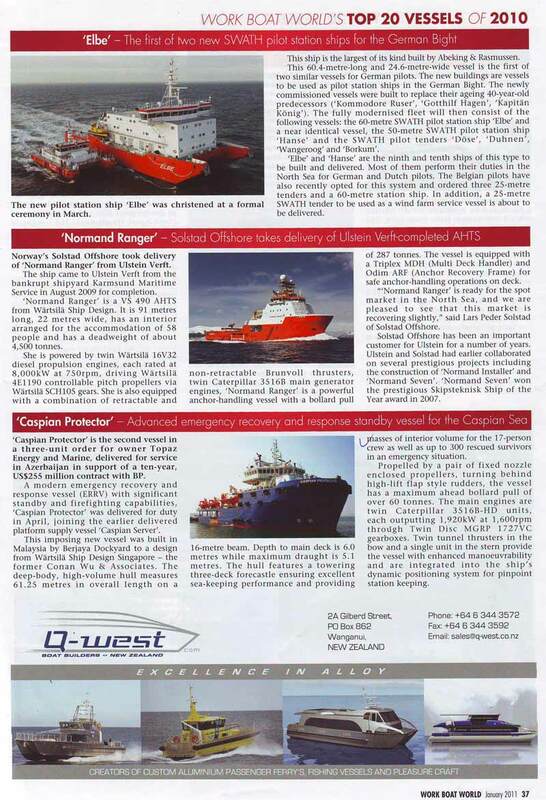 'Caspian Protector' is the second vessel in a three-unit order for owner Topaz Energy and Marine to be delivered for service in Azerbaijan in support of a ten-year, US$255 million contract with BP. 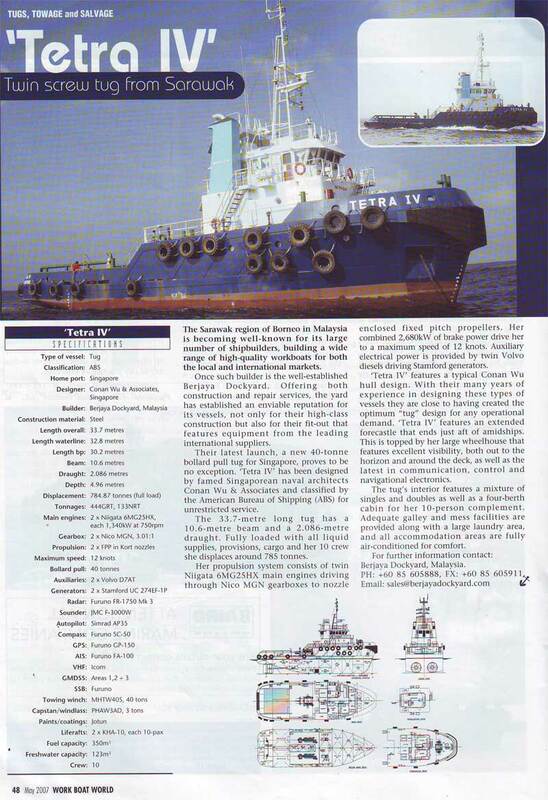 Caspian Protector had been selected as Work Boat's Top 20 Vessels of year 2010. 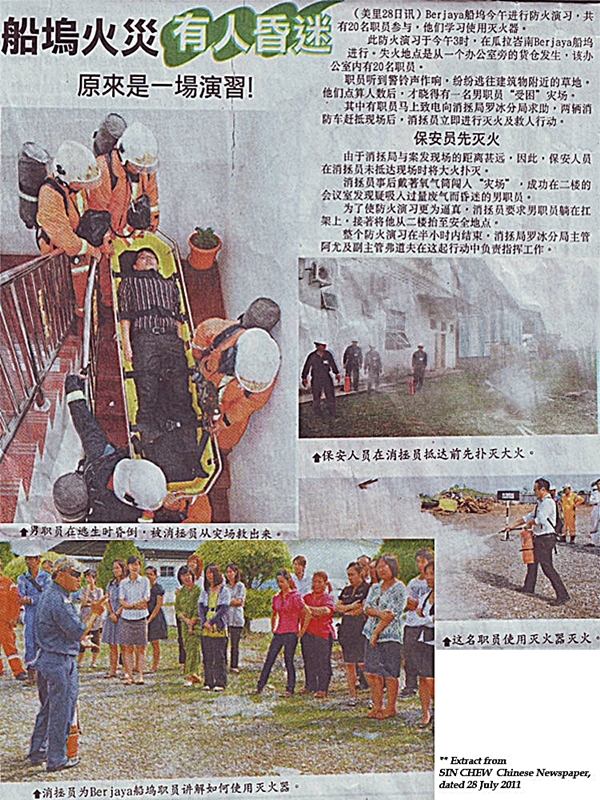 Berjaya Dockyard Sdn Bhd, on 28 July 2011, the Safety Department has had a Fire Drill activity to increase the safety awareness among their staffs. 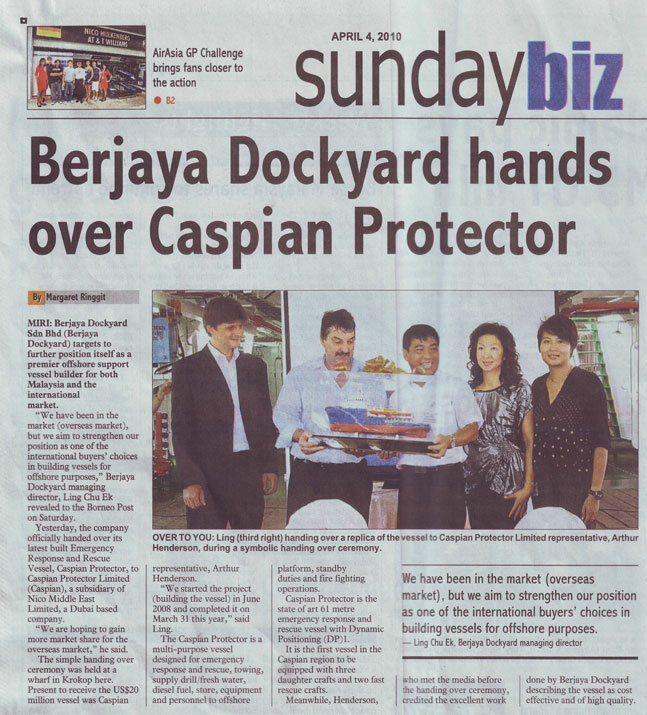 BERJAYA DOCKYARD LAUNCH POWERFUL NEW AHTS 'EFOGEN - NUHA'. 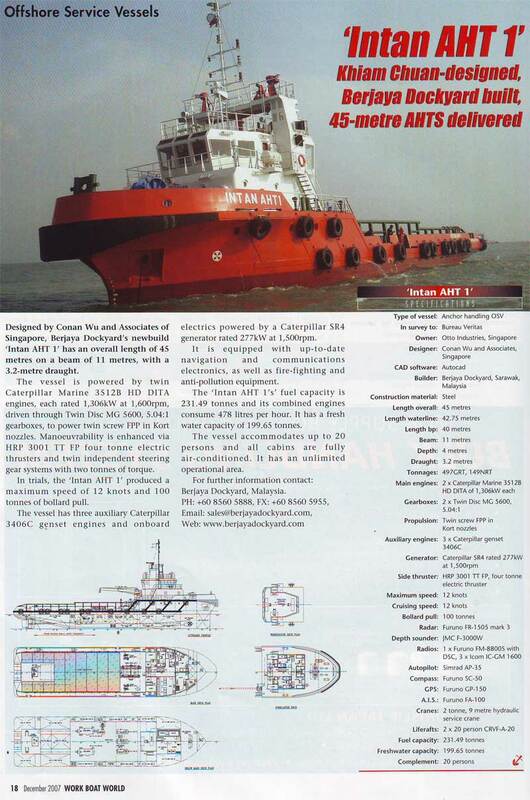 Measuring in at 1,976GRT, 'Efogen - Nuha' is a powerful new anchor handling tug/supply (AHTS) vessel from Malaysia's Berjaya Dockyard. 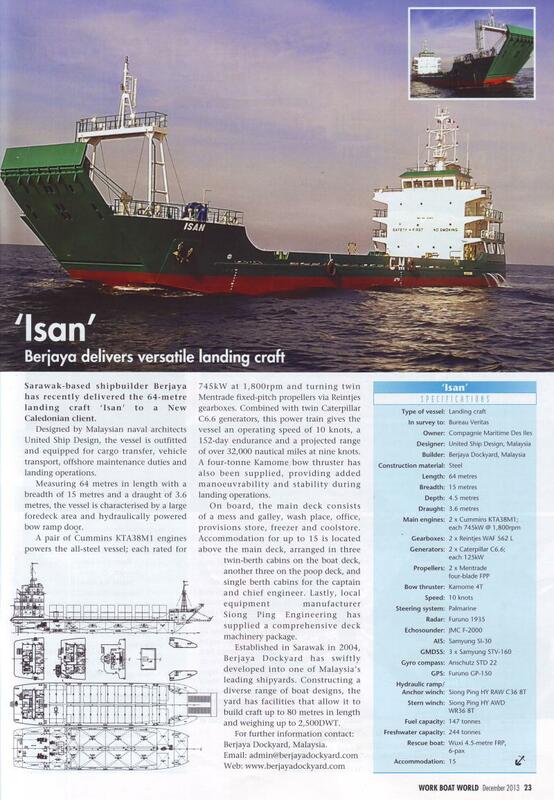 BERJAYA DOCKYARD DELIVERS VERSATILE LANDING CRAFT - 'ISAN'. Measuring 64 meters in length with a breadth of 15 metres and a draught of 3.6 metres, the vessel is characterised by a large foredeck area and hydraulically powered bow ramp door. 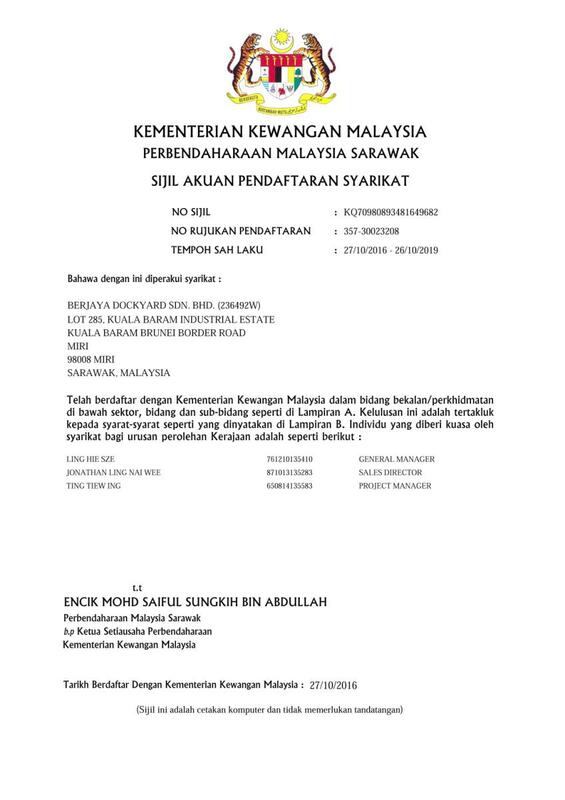 BERJAYA DOCKYARD had been granted license for shipbuilding and ship repairing by MITI, which active from 27/10/2016 to 26/10/2019.